Papua New Guinea continues to make its presence felt in the international arena despite tough economic times. 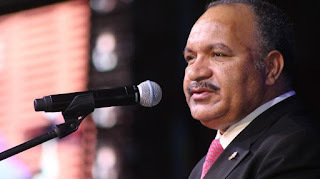 This week Prime Minister Peter O’Neill has travelled to the United Nations in New York to meet with world leaders as they discuss global national security challenges among others. Mr O’Neill will have a chance to meet US President Donald Trump, as the still-new president hopes to use his first appearance before the UN General Assembly to rally other countries against North Korea’s nuclear threats. Mr O’Neill will also meet the UN President of the General Assembly Miroslav Lajcak and rub shoulders with French President Emmanuel Macron, Israeli Prime Minister Benjamin Netanyahu and UN Secretary General António Guterres. He will also meet with Japanese Prime Minister Shinzo Abe and South Korean President Moon Jae-In as they meet to discuss issues of peace and advancing global understanding of the critical role of multilateralism in our modern world and in serving the needs of all people. Mr O’Neill will have a chance to meet US President Donald Trump who will use his first appearance before the UN General Assembly to rally other countries against North Korea’s nuclear threats. This year’s 72nd General Assembly of United Nations started yesterday morning where Mr O’Neill will present PNG’s country statement.